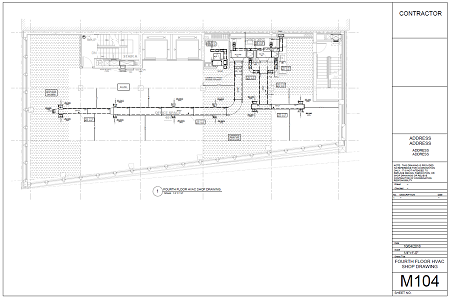 Are you a contractor who needs ductwork or plumbing shop drawings? If yes, then I can help you. I have a team of drafters who specialize in duct shop drawings. To date we've completed a number of projects around the US. Promptly answer your calls/emails, is reliable, is orderly, will give you realistic drawing delivery dates, has been around for years, has the experience you need, communicates well, and has more than one detailer so you're not left waiting in a long line. We create HVAC shop drawings, sprinkler shop drawings, and piping shop drawings for commercial and residential projects. We know our duct and pipe insulation thicknesses, duct branches, duct segment lengths (i.e. duct cut lengths), and etc. So the drawings my team creates for you will be correct, letting you complete your projects. At this point you may have liked what you've read about my People, Process, and Product. So you may want to see some sample drawings. My team is finishing drawings weekly. If you visit the draftingservices.com Instagram profile, then you will see some current sheet metal drawing samples mixed amongst other completed projects. Here is a mechanical shop drawing sample in PDF format. The drawings were drafted in AutoCAD ®. Click image to launch PDF. Why don't you make your life a little easier, by choosing to use draftingservices.com as your ductwork and plumbing shop drawing service? Let me put my People, Process, and Product to work for you.